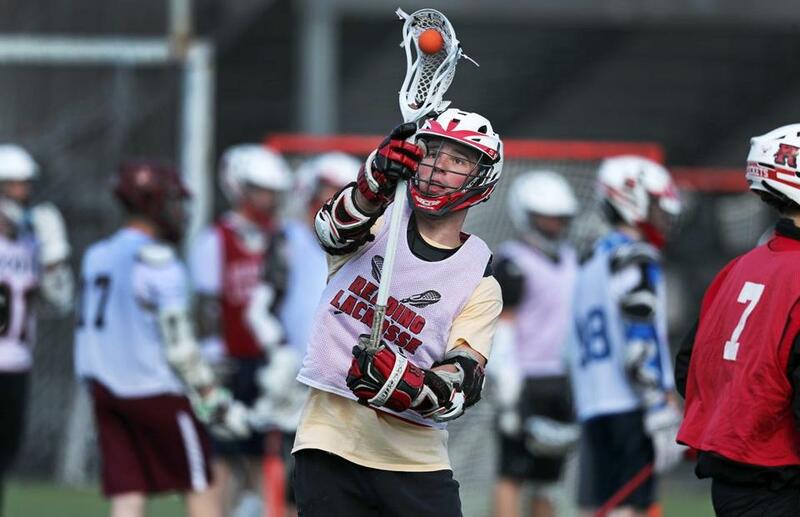 Reading High School lacrosse player Mike Tobin sets the tone for the team, both in practice and during games, with his dedication and work ethic. For Reading senior captain Mike Tobin, nothing would get in the way of winning a state championship — not even a partially torn labrum in his shoulder. The midfielder played through injury for most of last season, but still managed to help bring Reading lacrosse its first-ever state title, scoring five goals in the Division 2 state championship game against Concord-Carlisle. The 5-foot-9-inch, 180-pound senior was a Globe All-Scholastic as a junior, and has been a four-year starter and senior captain for both the Rockets’ lacrosse and hockey teams. In his first three seasons on the lacrosse team, Tobin tallied 146 career goals and 100 assists (51 and 31 last season). Verbally committed to play lacrosse next year at the University of Massachusetts Amherst, Tobin, who also plays for the East Coast Rockets club team, is primed to lead Reading alongside fellow captains Domenic Masucci, Charlie Giuliotti, Josh Williamson, and Noah Donovan. After Reading graduated nine seniors, including his standout linemate Jack Geiger, who now plays for UMass, Tobin is ready to step up and lead the Rockets. A leader by example, Tobin jumped to the front of the line for every drill on the first day of tryouts Monday at Reading High, doing exactly as the coaches asked without a second of hesitation. During half-field scrimmages, Tobin took the ball at the top of the box and on his first run had the opportunity to take a decent shot with some open space or to pass to an open finisher on the crease. Tobin fired a no-look pass inside without a second thought. On his next run, he did the same — feeding inside and letting his teammates shine on the first day of the new season, over and over again. Head coach Charlie Hardy, who has worked closely with Tobin since his freshman year, when he started as an attackman, said the biggest change in his game has been his awareness. “He’s become such a student of the game and he knows what it takes to play well here and at the next level,” Hardy said. Tobin’s older brother Kevin is a sophomore midfielder for the Minutemen after playing two seasons with Mike at Reading. Hardy said Mike has followed in his brother’s footsteps. Tobin’s fellow captains appreciate the example he sets. “He’s a great teammate and there’s nothing he wouldn’t do to win,” said Josh Williamson, a senior midfielder who will play for Regis next year. Despite earning a number of Middlesex League All-Star honors in both hockey and lacrosse and being named a two-time Boston Lax All-American, Tobin keeps his eye on one prize. “State champion is the only stat or award that matters to me,” Tobin said. Tobin will join his older brother and Geiger next year at UMass, where he plans to study economics. The chance to play together again influenced his decision. Hardy, a UMass man himself, is confident in his players’ ability to translate at the next level.